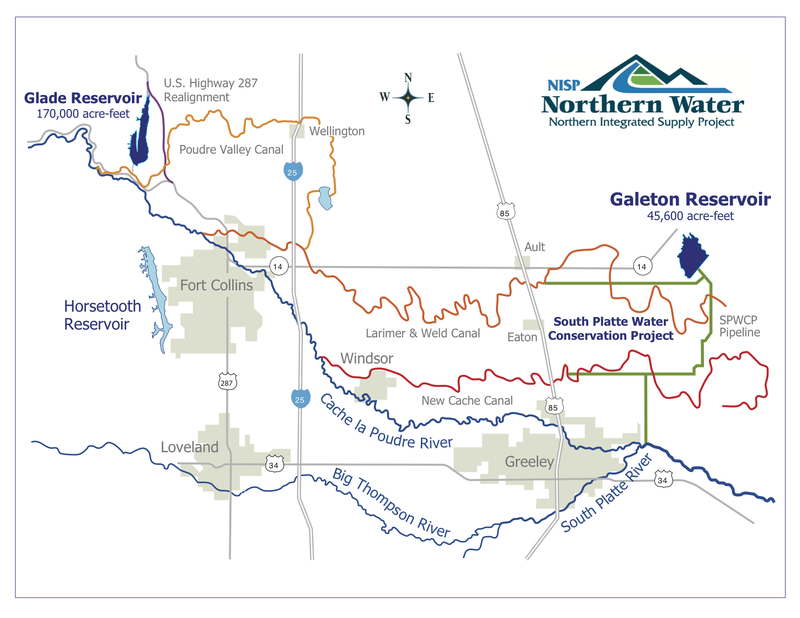 The Northern Integrated Supply Project and the Windy Gap Firming Project, both projects managed by the Northern Colorado Water Conservancy District, have been decades in the making, and once they’re complete, they’ll result in three new reservoirs intended to address a growing Front Range population. During the Northern Colorado Water Conservancy District’s fall water users meeting Wednesday in Fort Collins, officials took an audience through the progress of both projects. The Northern Integrated Supply Project, which would affect Windsor and Evans, hit a major milestone in July after an Environmental Impact Statement was released. “In 2019, we’re hoping for a really big, exciting year, in addition to the really big year we had this year,” said Stephanie Cecil, water resources project engineer for Northern Water. The Windy Gap Firming Project, which would affect Greeley, is moving forward even as the project has been hit with a federal lawsuit. In July, the U.S. Army Corps of Engineers released its final Environmental Impact Statement on the project — a process that took 14 years. “It’s a really significant step in the project to be able to have all of those things done,” Cecil said. Right now, the group is focused on design, particularly for the Glade Reservoir and the Galeton Reservoir. One pressing step in the project will be to relocate a section of U.S. 287 to allow for construction of the reservoir. Additionally, the organization is working on mitigation projects, including one to help pass fish though a diversion structure and measure the amount of water the group is handling. The group is also working on permitting with counties and the state, and developing a financing plan. “How is this over $1 billion project going to be financed, and how is the construction schedule going to line up with the financing plan?” Cecil asked. Construction could start by 2021, Cecil said, and the projects that will likely get started first are the Glade Reservoir and the U.S. 287 relocation. Cecil said the group hopes that the reservoir will be filled in 2026 and able to serve water in 2030. A graphic from Northern Water showing the lay out of Windy Gap Firming Project. 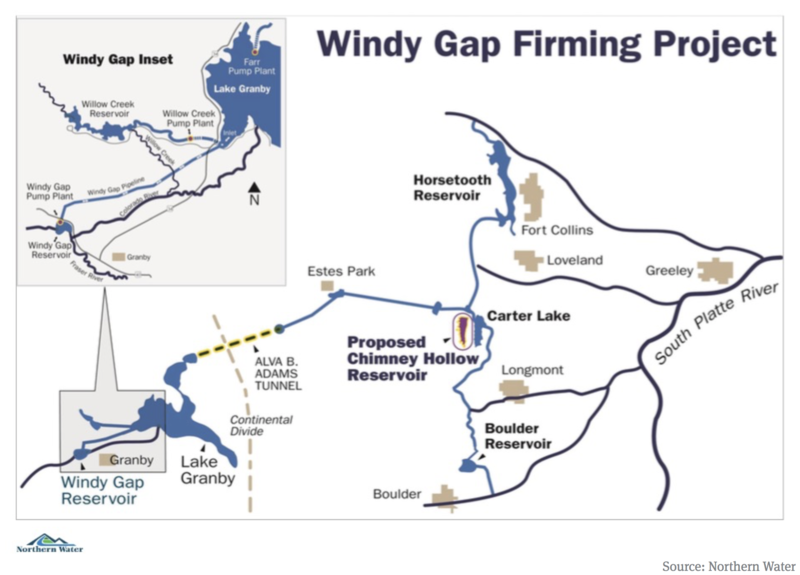 The Windy Gap Firming Project, a collaboration between 12 northern Colorado water providers, including Greeley, will result in a new reservoir — the 90,000 acre-foot Chimney Hollow Reservoir — and the largest dam on the Front Range. When it’s complete, the project intends to make water supplies more reliable by installing the reservoir west of Carter Lake in Larimer County. For the past year, the project has been in the middle of a lawsuit filed by environmental groups against federal agencies. The lawsuit questions the need for the project, saying it would make significant water diversions from the Colorado River, and that the U.S. Bureau of Reclamation and U.S. Army Crops of Engineers did not have enough information before they issued initial permits to the district. Drager said the group hopes to start construction in 2021 or 2022.